If anything deserves to be considered along the lines of vegetable candy, it may be roasted fennel fits the bill. If the idea of veggie-candy has any appeal at all to you, then you've got to try it. If not, you still must. Really. You can detest licorice (don't be haunted by long ago, lip-staining black jellybeans). Chances are you'll like this. I've been falling in love with fennel lately. Cooler, shorter days and a sudden influx of colds and bugs to ward off means I'm craving warm, soothing, comfort foods more, and enjoying raw vegetables a little less often. Luckily, roasting vegetables, though time-consuming, is almost as easy, prep-wise, as putting together a plate of raw. The flavors are rich, and mellow, and what's more, you can retain important nutrients, too, without having to worry about vitamins and minerals being leached out into cooking water and lost. 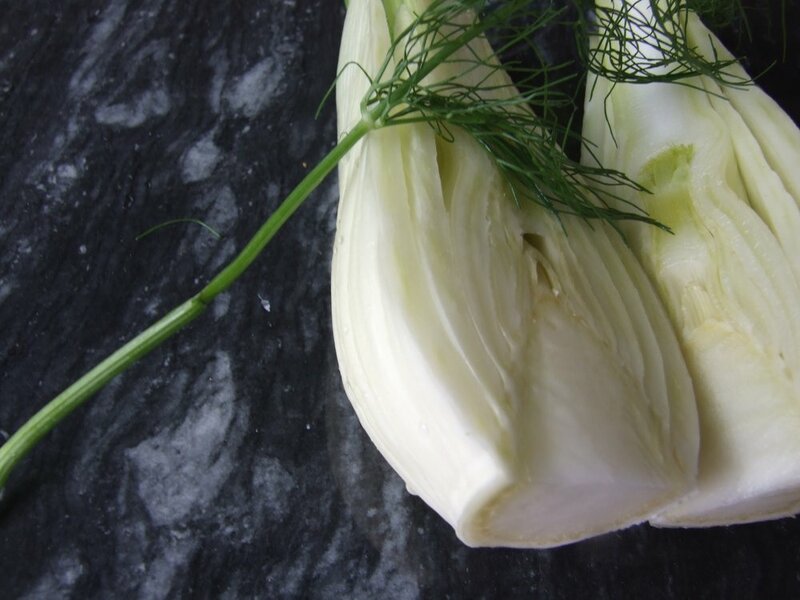 Fennel is a little like the familial black sheep, considered a bit out there, and often misunderstood. This Mediterranean native is a powerhouse for vitamin C, as well as a great source of fiber, manganese, potassium, folate, and other wonderful nutrients packaged up in a crisp white bulb. I never really dared incorporate it much into recipes, fearing that trademark aniseed flavor would be too strong. But actually, I'm finding fennel is quite versatile, and delicious even on its own. Crunchy, mildly sweet, it pairs beautifully and surprisingly with a whole range of other ingredients, too. With fish, as in this yummy comfort roast from Eating Well; and with apples, like in this sausage and sauerkraut casserole recipe, also from Eating Well (we used bison sausage instead of kielbasa, and it was wonderful). My favorite so far, however, has been enjoying the simple ease of roasted fennel. Caramelized, brushed with a little olive oil and balsamic vinegar, it's got substance that is more calm than powerful, and is delicious. It's a great snack, side, or base for roasted chicken or other meat. Lest you feel wasteful when working primarily with the bulbs, notice the prettiness of the wispy fronds. They make a great garnish, over salads, or added in breads and other dishes as you'd use dill. The stalks can be used too, like a sub for celery. All in all, fennel is fabulous, no question about it. Rub just enough olive oil over the fennel to coat. Sprinkle on some balsamic vinegar, also to coat. Line baking dish aluminum foil. Lay out the pieces of fennel and roast for 30 minutes, or until the fennel is cooked through and beginning to caramelize.